Do you have the same feeling as me? Anything stuffed tastes so much better. And if it is chicken, it can't be a miss with me. I love the simplicity of chicken in the sense that you can combine it with many different things, cook it in so many ways and never get bored with it. There's only one problem. Not only is this chicken stuffed, it will make you feel stuffed, too. But don't worry, it's sooooooooooo good you won't mind. I could eat this every day, I swear. Slice the leek and saute for a few minutes until soft. Set aside and let it cool completely. and mix with the leek. Carefully and slowly. If you tear the meat, the stuffing will leak out during cooking. Season the chicken with salt and poultry seasoning, inside and outside. 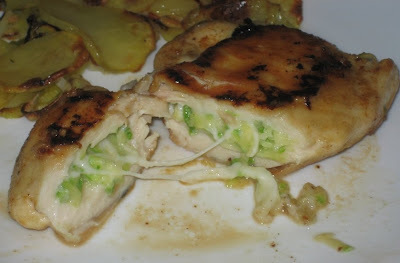 Fill the breasts with the leek and cheese mixture, and close the opening with a toothpick. You see, making a small opening, makes it easier to close, you need only one toothpick. Flour the meat on both sides, shake off the extra flour. In a skillet, warm up the oil and butter and add chicken. Cook on both sides until the chicken is nice golden brown. Add Marsala and let it evaporate a little bit, then cover, reduce the heat to minimum and cook for about 5-10 minutes, (depends how thick your chicken is), turning once, until the meat is done. The chicken itself is very rich so I served it only with salad - a mixed salad with Iceberg lettuce, cucumbers, tomatoes, fennel and corn salad. I've used the same recipe before but with zucchini, and, as much as I love leeks, I think I prefered it with zucchini. If you'd like to try, substitute leeks with shredded zucchini (no need to precook them). On that occasion I also prepared Crispy potatoes (with a layer of sliced leeks underneath). Questa è una delle ricette per il petto di pollo che mi piacciono di più. La carne rimane morbida e per niente asciutta. Un piatto molto saporito. Nello stesso modo potete riempire il pollo con la zucchina. Semplicemente sostituite il porro con la zucchina grattugiata grossolanamente (senza cuocerla prima). A me è piaciuto ancora di più con la zucchina. A voi la scelta. Tagliate il porro a rondelle e soffriggete per qualche minuto con un cucchiaio di olio. Lasciate raffreddare e poi aggiungete la mozzarella grattugiata con una grattugia a fori grossi. Incidete una tasca nei petti di pollo. Potete farlo tagliando lateralmente oppure come nella foto, infilando il coltello nel senso della lunghezza dalla parte più spessa. Insaporite il pollo a piacere e riempite con il ripieno di porro e formaggio. Passate la carne nella farina e scuotete via quella in eccesso. Scaldate in una padella l'olio e il burro e doratevi il pollo per 10 minuti, girandolo una sola volta. Sfumate con 1/2 bicchiere di Marsala, coprite e lasciate cuocere a fuoco basso per altri 5-10 minuti per terminare la cottura. Anche in questa ricetta ho usato le verdure di stagione, e quindi la mando a Betty per la sua raccolta. Visitate il suo blog per saperne di più. Pileća prsa su idealna kad želite spremiti nešto brzo i što će se svima svidjeti. Ali pripremate li ih uvijek na isti način, prije ili kasnije svima će dosaditi. Stoga evo ukusnog receptića za punjena prsa. Meni se jako sviđa. Meso ostane sočno i mekano, a budući da obožavam sir i sve vrste punjenja, smatram ovaj recept neodoljivim. Na isti način pripremite punjenje s tikvicom. Naribajte krupno tikvicu (bez da je kuhate) i pomiješajte s mozzarellom. Ostatak je isti. Narežite poriluk na kolutiće i popržite kratko na žlici ulja da omekša. Ostavite da se ohladi pa dodajte grubo naribanu mozzarellu (ili je narežite na kockice). Zarežite džep u pilećem filetu (ili prorežite sa strane ili zarežite nožem po dužini s deblje strane fileta). Posolite i povegetite meso pa napunite nadjevom od poriluka i sira. Zatvorite čačkalicom. Pobrašnite meso, otresite višak brašna pa popržite na ulju zagrijanom zajedno s maslacem 10 minuta da porumeni s obje strane. Dodajte Marsalu (ili bijelo vino ako nemate Marsalu), ostavite da malo ispari, poklopite i kuhajte na niskoj temperaturi oko 5-10 minuta da se meso skuha do kraja). Ovaj je recept i na stranici Coolinarika.com. I don't use leeks nearly enough as I should. I'm going to give this a try. I love the way you stuff them. So neat this way and they look beautiful. I love the versatility of chicken, too! Your stuffed chicken is simply gorgeous!! That's a great stuffing technique. The chicken looks awesome, I'm a huge chicken fan too. adoro il pollo!! figurati se preparato così non te lo spazzolo tutto!! super! What a great way to stuff chicken. I really like the technique you used. Thanks for the photo of this! I'm very visual. Mozes mi, molim te, dati link na 'grcku baklavu' ne mogu naci recept na tvom blogu (ne znam ni da li se tako zove):)? Chicken is such a versatile meat. You have shown in your blog post that chicken can be stuffed with ingredients that can be delicious and still very healthy. I have been really enjoying your blog posts. Mmm...looks delicious. I love the cheese oozing out. did someone say chicken? LOL. love the stuffing technique. Soooo much better than pounding and rolling the little suckers. ok, I have to make this one this week for sure! It looks delish.